One third of the safety failures is linked to CNS toxicity during the clinical trials of drugs. 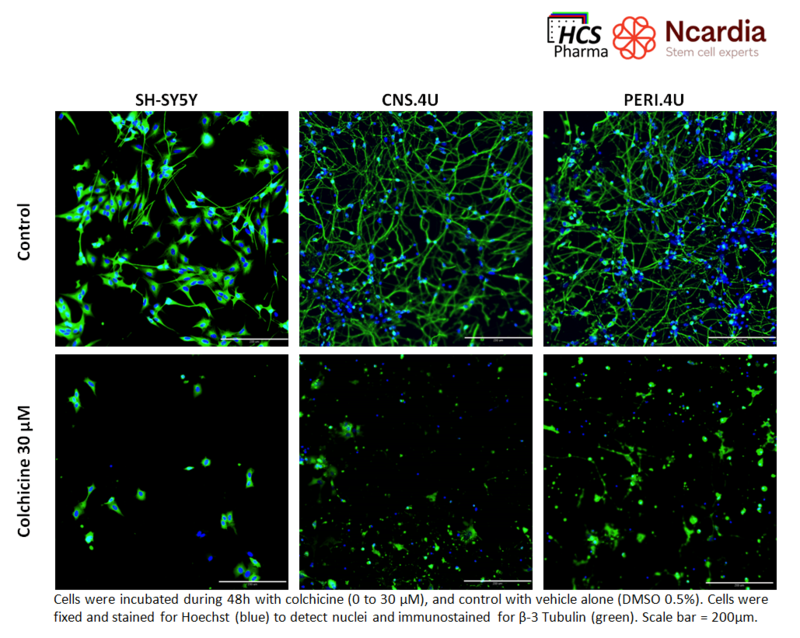 In order to develop a more predictable in vitro human model for neurotoxicity testing, we have compared the sensibility of iPSC-derived neuronal cells and SH-SY5Y cell line (neuroblastoma-derived cell line) to a panel to 32 compounds. iPSC-derived cells present several advantages, in particular their availability compared to human primary cells and their non-cancerous origin. Two types of iPSC-derived neuronal cells were tested: central nervous system cells (CNS.4U™ cells) including neurons (glutamatergic, GABAergic and dopaminergic) and astrocytes, and peripheral nervous system cells (PERI.4U™ cells), from our collaborator Ncardia. We tested compounds known as non-toxic, non-neurotoxic and neurotoxic. As a result, sensibility for many compounds is higher on iPS-derived neuronal cells compared to SH-SY5Y cells. Therefore CNS4U™ and PERI4U™ seem to be interesting and valuable alternatives to neuronal cell lines like SH-SY5Y! Moreover, the presence of astrocytes in CNS.4U™ cellular mixture can improve the relevance of the model by indirectly impacting on neuronal responses and survival. Apart from toxicity studies, iPSC-derived neuronal cells are of great interest in pathophysiological studies, or for the development of relevant in vitro models, like blood-brain barrier in vitro model for example! Many perspectives with iPSC-derived cells from Ncardia!